You can link your accounts from third party services to your Lens profile. We currently support LinkedIn and ORCID accounts. By linking your ORCID account you can automatically update your ORCID works with patents from recorded inventorships. Linking these services will also allow other users to view your public profiles on the linked services for all your recorded inventorships. Another benefit of linked services is that you can use them to sign in to the Lens. For that, both the sign in and registration pages offer alternative sign up methods, using third party services. You can link third party services to your existing Lens account using the Linked Services tab in your work area. The Linked Services tab in your work area allows you to manage your linked services, such as ORCID and LinkedIn. Head to the Linked Services tab in your work area – you need to be logged in for this. Click ‘link’ on the right hand side next to the corresponding service. A popup will open and take you to an authentication form of your third party service. This page is provided by the third party service and we have no control over the content of the page or the data you enter. To remove a linked account, simply click on the ‘remove’ link next to the account. In any case, you can simply re-link the account using the ‘link’ button, as described above. Please note, it’s not possible to link the same third party account to multiple Lens profiles – just in case you if you have multiple Lens accounts you can only link a third party account to one of them. You can also use third party accounts to register or sign in to the Lens. Simply, choose the corresponding options in the sign in or registration dialog. When you use a third party account that hasn’t been previously been linked to a Lens account, we will try to retrieve and link any existing Lens account that shares the same verified email address. If you haven’t previously created a Lens account we will simply set one up for you using your provided details. In this case, you might need to verify your email and choose a username before you can use the Lens account. If you have already an existing Lens account we recommend linking the third party account first using the linkage instructions above. After that, you can use either your Lens account credentials or third party services to log in to the Lens. If my patent transfer is incomplete to my ORCID data, what can I do? b) If step (1) doesn’t work, re-link please to your ORCID account: Under the sign-in menu you can go to ‘Linked Services’ [see screenshot B] and then for your ORCID account click ‘Remove’ and then ‘Link’ the account again. Then do step (1) again. LinkedIn and ORCID are registered trademarks. The works will sync again if you delete them from your ORCID record. 1. On the ORCID site, use the “Bulk edit” feature to delete the Lens.org works from your ORCID record. 3. 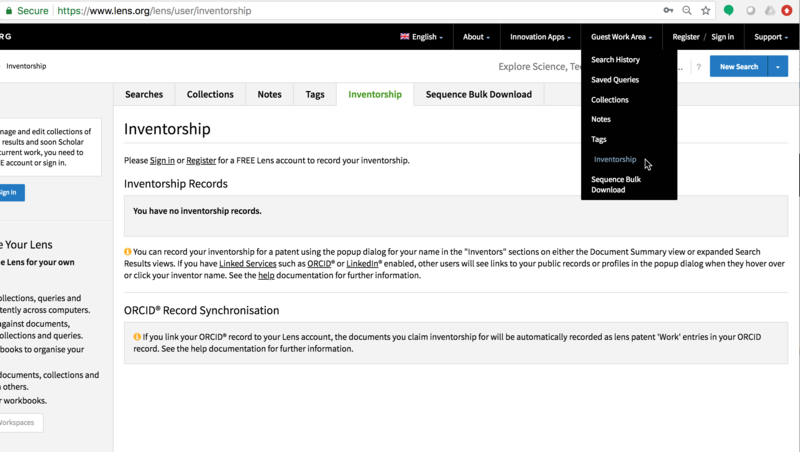 Click the “ORCID Sync” button to synchronise your Inventorship records with your ORCID record.